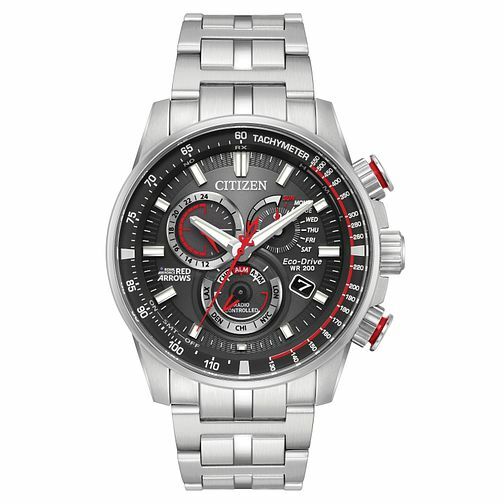 This stylish Royal Air Force Red Arrows men's watch from Citizen with Eco-Drive technology features a durable stainless steel bracelet strap and casing, and black bezel with the tachymeter feature. The black dial displays the sub dials for the stopwatch functionality, day and date displays, luminous hour and minute hands and famous red of the iconic Red Arrows. This quartz watch is also water resistant to 200 metres. Citizen Red Arrows Men's Bracelet Watch is rated 4.8 out of 5 by 6. Rated 5 out of 5 by Anonymous from Stylish and great usability The Red Arrows special edition is very stylish and is easy to set up. The ecodrive system is a product leader.